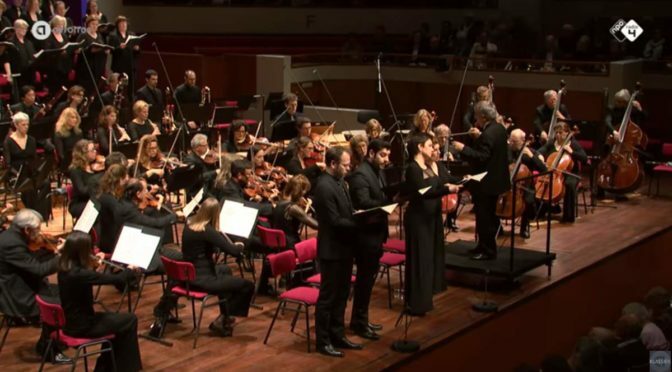 Netherlands Radio Philharmonic Orchestra and Choir perform Felix Mendelssohn’s Symphony No. 2 in B-flat major, Op. 52, commonly known as Lobgesang (Hymn of Praise), composed in 1840. Conductor: Markus Stenz. January 23, 2015 in De Vrijdag van Vredenburg, TivoliVrededenburg, Utrecht. Conducted by Mariss Jansons, the Royal Concertgebouw Orchestra of the Netherlands and the Netherlands Radio Choir (chief-conductor Celso Antunes) performs Gustav Mahler’s Symphony No. 2, known as the Resurrection Symphony. Soloists: Ricarda Merbeth, soprano; Bernarda Fink, mezzo-soprano.